NES Bionic Commando (USA) in 12:25.62 by nEilfox, Alyosha & Challenger. 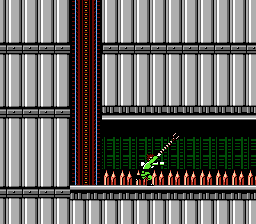 Bionic Commando (1988) is a platform game with a hero who can't jump, but can quickly latch onto objects with his bionic arm. The name of the original (Japanese) version of the game literally translates to The Resurrection of Hitler: Top Secret. Nintendo censored the Nazi references for the North American version. This is an improvement of 56.28 seconds over the previous movie, mainly thanks to a new trick in Area 12 where if damage is taken from an enemy at the same frame one would normally take damage from a barrier, one'd pass through the barrier, assuming the player's position is correct. For more swinging goodness, check out these runs of the Game Boy and arcade versions. There is also an "all items" run which completes the optional stages as well.